Can anyone crack the code? When an unknown Country X sends the dangerous spy known as “The Awaker” to infiltrate China using an advanced coded communication system known as “Purple Secret,” the government can’t seem to crack the code. Dang Zheng, deputy director of the government’s special decoding department called Unit 701, goes on a recruiting mission to find the brightest talents that can help the country fight back against the proliferating evil spy network. Autistic math genius Rong Jin Zhen (Cheney Chen) is forced to give up his academic pursuits when is recruited into Unit 701, working alongside the beautiful cryptographer Di Li (Ying Er). As Jin Zhen embarks on his new dangerous mission to crack the “Purple Secret” code, he is only able escape from several dangerous situations with the help of Shen Yu Er (Ady An), a young woman who lives in a fishing village. Can Jin Zhen and his fellow cryptographers survive their new espionage training and crack the code? 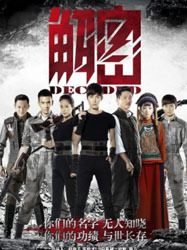 “Decoded” is a 2016 Chinese drama series directed by Atkins.